Martin Short and Nancy Dolman arrive at the Vanity Fair Oscar Party on February 22, 2009, in West Hollywood, California. Los Angeles, California (CNN) -- Nancy Dolman, the wife of actor-comedian Martin Short has died, Short's representative said. 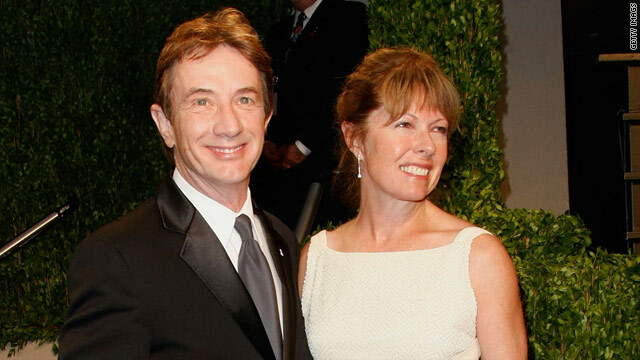 "Sadly, we can confirm that Martin Short's wife did pass away," Camille Kuznetz said Monday. "We do not have any other comment to make." No details about the time, location or cause of Dolman's death were released. The Los Angeles Fire Department responded to a call for emergency medical help at the couple's Pacific Palisades home Saturday morning, LAFD spokesman Brian Humphrey said. Paramedics did not transport anyone from the home, Humphrey said. The Los Angeles County Coroner's office had no record of her death, but the office would only be aware if a death was sudden, unexpected or from unnatural causes, a spokesman said. The couple had three children during their 30-year marriage. Dolman, 58, was a comedic actress and, like Short, a native of Canada. Her acting career included a recurring role on TV's "Soap" in the late 1981, although she soon gave up her acting career to raise her children, according to the Internet Movie Database.